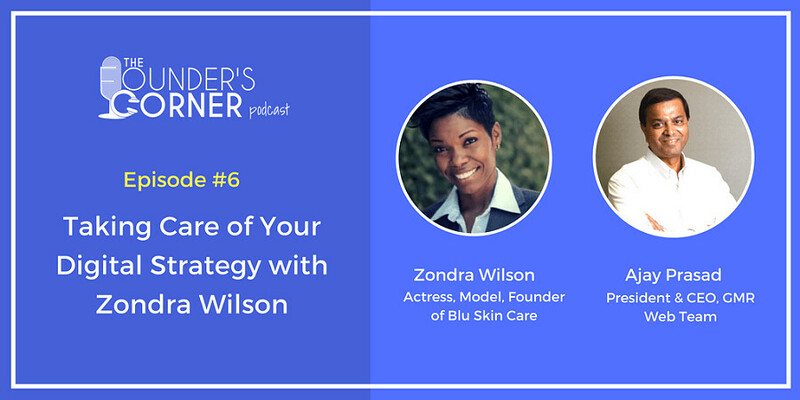 Zondra Wilson is an actress, model and the founder of Blu Skin Care, which manufactures and distributes USDA certified organic and natural skin care products. Announcer: Hello, and thank you for listening to The Founder’s Corner podcast hosted by Ajay Prasad. Join Ajay as he sits down with business owners from around the world to discuss their business struggles. As an entrepreneur and proud owner of many seven-figure web-based businesses, Ajay has dedicated himself to helping businesses of all shapes and sizes grow. If you would like to reach out to Ajay, fill out the form on our site. Enjoy the show. Ajay Prasad: Hello, and welcome to The Founder’s Corner podcast. This is Ajay, and, with me, I have Zondra Wilson of Blu Skin Care, LLC. Blu manufactures and distributes USDA-certified organic skincare products. How are you today, Zondra? Zondra Wilson: I’m doing well. How are you today? Ajay Prasad: I’m doing fantastic. First, let’s learn some more about your business and its successes up until today. Zondra Wilson: Sure. Blu Skin Care was started back in February of 2015. Basically, it’s been a work in progress over the last 20 years, I would say. My mom and my aunt would use products from the farm – organic stuff – on their faces because, back in the ‘50s and ‘60s, they couldn’t afford the higher-end skincare products. They would tell me all about this, like olive oil and coconut oil, but I was too “bougy” to use of that stuff. I called it “kitchen stuff,” so I would go and buy Clinique, Kiehl, and higher-end products for my face. An incident happened where I couldn’t afford those products anymore. I had a financial situation that happened, so I ended up using some of the recipes and some of the ingredients that they had recommended, and oh, my gosh! I wasn’t expecting the results. I wasn’t expecting what it did for my skin. I knew what it did for their skin. You have this thing in the inner city where the more melanin you have in your skin, the fewer wrinkles you get. Anyway, after I watched and looked and saw for myself, I never went back. Ajay Prasad: That’s fantastic. When you were USDA certified, did you create your own formula? Zondra Wilson: Yes. With USDA, there are only about nine of us in the country, believe it or not. You have a lot of organic skincare lines, but not USDA certified. The bottom line with USDA is that it needs to be edible, which is very hard to get past because most skincare products contain ingredients that you can’t necessarily eat. One of the things that I’ve always been taught and that I believe in is that if you’re putting it on your skin, it should be something you should be able to eat because anything you put on your skin ultimately seeps into your bloodstream and into your body. So, these recipes and these ingredients were things that, like I said, my mom used from way back, and then I started using them. I went to the Whole Foods stores. There are local farmers here. You want the absolutely purest products. That was the key. You don’t want just oatmeal, but you want the pure, non-GMO oatmeal, things that are made with little-to-no preservatives. So, that’s the key with Blu Skin Care. It’s not just that we have products, but it’s the type of products that we have. It’s really good for people who have rosacea, psoriasis, eczema, or any skin condition, or if you have an illness. Some people who are fighting cancer or pregnancy or things of that nature like to use our products because there’s nothing in them. They’re just pure. Ajay Prasad: So, then, because it is your own blend, have you filed for any kind of patent, for example, so that you are protected? Zondra Wilson: Oh, no, I haven’t because, with skincare, it’s all the same anyway. The only differences are the types of ingredients that I use, and, of course, with some of the packaging, you don’t have to release every ingredient, but it’s no secret, I guess is what I’m trying to say. It’s just a matter of the formulations. If you have chemicals and stuff like that, which is something that a lot of the skincare companies do, then they patent those types of things, but when it’s all-natural skincare, you can’t patent it because it’s all-natural. I can’t patent oatmeal and flaxseed. Those are things that anyone can buy. Anybody can buy that, but if it’s a specific chemical that I’m coming up with, then, yes, I could patent it. Ajay Prasad: Okay. That is always the big danger because what happens is, as you start to pick up, big guys can just go in and copy it. Zondra Wilson: They do it anyway. Ajay Prasad: Yes, that’s true. It’s great to know. You said you started last year? Zondra Wilson: No, I started in 2015, so this is my third year. Ajay Prasad: So, how has the performance been up until now, in terms of success? Tell me some of your successes and some of your challenges that you have had. Zondra Wilson: The biggest success that I wasn’t expecting was the amount of media that Blu Skin Care has gotten. If you go on our website, and you go under the Press section, just within a year’s period, we have over 100 mentions from Chicago Tribune, every type of blog, beauty magazines, and women’s fitness. In just every type of media outlet that you can think of, Blu Skin Care has been included, and the beauty about it is that the beauty bloggers have taken our product and compared it to others like Kiehl, Clinique, and all of these other high-end brands, and our jojoba eye serum product ranked right up there with those brands. We are so proud, and I guess we weren’t expecting that. The key is that it works. Ajay Prasad: So, how did it happen? Tell me how the press found out about your products. Zondra Wilson: They found out by us submitting them. I’m a former news reporter, so I have some connections, and I was sending out press releases. I was sending my product to beauty bloggers, people who had a huge following, people who I knew were honorable and would really test it and give an honest critique. That’s where I started. I started sending product out to these guys, to get them to try it and actually give a critique, to actually write about it. What you want them to do is write and recommend. So, that’s what started happening. They were trying my product, writing about it, and telling their followers, so that’s how the ball got rolling. Ajay Prasad: That’s fantastic. Like you said, your experience as a reporter helped, I guess. Zondra Wilson: It helped a lot. Ajay Prasad: So, has all this press also resulted in increased sales? Zondra Wilson: Yes, that’s the key. I noticed it even with my SEO ratings. When you start off, no one knows who you are. I would plug in “Blu Skin Care,” and if I didn’t put in the full address, then it wouldn’t come up at all on the rankings, in Yahoo! or Google. So, now, you can just plug in “Blu.” You can plug in “organic skincare,” and Blue Skin Care will pop up relatively quickly. I’ve noticed this with the press, obviously, because it draws more traffic to my website. Plus, I have bloggers who are now coming to me who want to post stories and things of that nature on my website to bring their followers to me. Yes, the press definitely helps. It’s like getting the word out and marketing, and then, with that, sales. You don’t want to bring them in to just buy one time. Obviously, you want them to continue to be a customer, so when they come in and try it, then they tell their customers. Word of mouth is amazing. Ajay Prasad: That is fantastic. So, your company is profitable right now, correct? Zondra Wilson: Our sales are increasing, but the company itself won’t be profitable probably until next year. Ajay Prasad: I just wanted to get the basic background. So, let’s dive into your questions for me. Zondra Wilson: Hooray, I’m excited! So, my main question is: What are inexpensive ways to market? I’m trying all different types of stuff, obviously, to bring in more money for Blu Skin Care, but I’m hoping to find out if you have any other ideas that you can help me with, which are inexpensive and can bring business to Blu. Ajay Prasad: Sure. Can you hear me? Zondra Wilson: Yes, I can. Ajay Prasad: This is the first thing I always suggest to everyone. You already have a customer base, so what you want to do is tap into your customer base and see if you can get some referrals from them. So, the first thing is referrals. The second is that I’m assuming – I’ve not checked it – that you’re trying to sign them up on a subscription basis so that you are automatically shipping them the product. Ajay Prasad: You want to have a customer base where you know that, every month, you are going to have X dollars in sales, and that should be increasing. My suggestion, always, is, since you have a customer base and this is a product that, once they have used it up, they need more of, to sign them up on some kind of subscription program so that you’re just automatically charging their credit card and shipping them the product. The second is to run the list of your customers. They are buying mostly on the Internet, right? That’s where you are selling, correct? Ajay Prasad: So, you should have their email addresses. You can use those email addresses to effectively target similar profiles. Facebook has a fantastic tool where you can really hone in on a very narrow segment of people who are exactly like your current customer base and then target them. Right now, my suggestion would be that digital marketing should be the key marketing method that you should focus on. Obviously, what you’re doing is wonderful, like getting press mentions. All the things you have done are great. Now, what you have to do is use all that information as, for lack of a better word, an argument for your product. When I say “argument,” think of your customers or your prospects as the jury and then make an argument as to why they should buy your product, so ultimately their judgment has to be for this product instead of the competitors’. You already have a lot of information, so you want to build a case for your product, and then, you can use social media and digital marketing – Google AdWords is another example – to direct it to exactly the kind of people who you want. Now, the interesting thing or the good thing also about digital media is that you can do a very narrow targeting, so you can test with a very small amount of money. I am very big on testing, and I’m also very big on, if you fail, failing quickly and failing cheaply. What happens in marketing, because it is not a science, is that failure will happen. There will be times when everything will look logical and you’ll say, “This is a winner, an easy slam-dunk,” and it doesn’t work. So, that is why testing is very important, and digital marketing lets you test very cheaply. What I’m saying is that digital marketing helps you really, first, narrow-target. You want to target your product to as narrow a group as possible. You’ll decide to who target, like I said, really based on your customer base. I am very big on building on your current customers, rather than chasing. So, the first thing you want to do is get more sales from them, hence getting some kind of subscription program and offering them a reason to subscribe. Convenience is obviously the big factor, that they automatically get it every one month, two months, three months, or whenever they typically exhaust it. They can choose when to get it. Then, build upon that. There are a lot of analytics. Facebook allows you to use a list of your customers, and then it will identify the people exactly like those in Facebook. Then, of course, you can narrow your geography, area, number, and all those things. So, my sense is to really use digital marketing. The first thing you want to do is get to the point where you know, “Okay, when I run this campaign and I spend $100.00, I get $300.00 in sales,” or $500.00 in sales – a sales dollar where you are profitable. Then, you start to multiply it. So, say you know your digital target audience. Then, you say, “With this target audience, I’m only going to focus in Los Angeles,” and people like this. That way, you will not need a big budget, and you’ll have a chance to tweak your message. Suppose you get to the point where you want $100.00 to generate, say, $300.00 in profit, then once you have figured out that in Los Angeles, you can spend $100.00 and get $300.00, now you can move your budget to $200.00 and open it up, maybe to Southern California. If that $200.00 still gives you $600.00, then you open it further, so you open it all over California and bump your budget to $500.00. At some point, you will know that if you’re putting in $1,000.00, you’re getting $3,000.00 in profit. If you’re putting in $10,000.00, you’re getting $30,000.00. You want to reach a point where now you have a faucet that you can turn on, and when you open it up, you can get more and more from it. Obviously, as your sales increase, you’ll have to figure out how you’re going to do the fulfillment. The packaging, the shipping, and all those things multiply. So, this gives you the option to really work through the process so that have not only have you tested the sales, but you also know if there are operational issues and you can fix them. The last thing you want to do is invest $10,000.00, and get $50,000.00 in orders so that you have $30,000.00 in profit, and then fail because you are not able to fulfill. When you are starting a new business, when you are a small business, it is very important to make sure not just that the marketing is effective but also that your operations are working very well. The other thing that I will tell you is that, these days, yes, an influencer talking about it is great, but what your consumers are saying about your product on the Internet is very important. There are many review platforms, as you know. There’s Google, Facebook, and Yelp. In the beauty industry, you may have some other very specific ones. So, get a program so that you are encouraging your customers to go and write reviews on those platforms. The way it works with reviews is that, unless you are asking people to do it, typically you will not get it. So, that would be my suggestion for marketing right now. Zondra Wilson: So, you said to start off small. Since I’m in California, I should start off with Southern California and then open it up to the full California? Ajay Prasad: What you want to do is, say you are testing with a $500.00 budget – I’m just throwing a number – you want to make sure that that $500.00 investment is giving you the return, so your sales increase is such that now you are getting more than $500.00. Then you can increase it to $1,000.00. At some point when you start to increase the dollar amount, you will have to open it up to the bigger geography. And it’s not just limiting the geography. Like I said, you can limit the profile of the customer. With Facebook, you have this great advantage of literally saying, “I want women of this age group, this ethnicity, and this kind of education.” You can really narrow-target it. My suggestion to you is to use your current base to understand who your customers are right now. Then, when you are advertising to new customers, really make sure that you are narrow-targeting to that group. If you look at Facebook, which now is like a massive corporation, they started as just for people who were students at Harvard. Then, when that started to work, they expanded it to Ivy Leagues only. After that, they expanded it to students only, so you had to have .edu. When that was working, then, suddenly, they opened to everyone. So, yes, it took them six or seven years, or four or five years – I don’t know the exact number – before everyone could even use it. But they had tested not just the success but all the challenges that come with more people and more sales that you have, so by the time they opened it to everyone, they had the proper infrastructure to support it. Zondra Wilson: Okay. And should the platform be Facebook or Instagram? Which one should I test-market? Ajay Prasad: Test on both. Use a smaller dollar amount and see what platform. Even the Google beta advertising may work. All you care about is, “If I’m spending $100.00, do I get $300.00?” or whatever is needed because you have the product cost and everything, so you will know the profit margin. Then, you try two or three different platforms and see which one gives you the best return. Then, start to expand on that. Then, you say, “Okay, I’m just going to hold these other two platforms, and I’m just going to focus on this to expand it to a bigger and bigger area.” I’m very big on the fact that you choose one platform. Once you select one, until you have exhausted it and say, “Okay, I have maximized this platform,” I wouldn’t even bother with the second platform, for the small business. Zondra Wilson: Does it matter if it’s a video, or should it be just a regular ad, like a picture? Ajay Prasad: Again, I would try both. Video should be much more effective for your product. I’m saying it should be, but it can’t hurt to test it. See, in the first couple of months, all you will be doing will be testing different programs to see what works and what doesn’t work. Zondra Wilson: Okay, that’s it. You’ve answered that question. The second question that I have is about different contest ideas to make money for my business. Ajay Prasad: You mean for your current business right now? Zondra Wilson: Yes, for my current business. Ajay Prasad: I will tell you this as a fellow entrepreneur. Also, I’ve consulted for a very long time now. For 12 or 13 years, I’ve been consulting with small-business owners. I always discourage entrepreneurs from jumping into a new product until you really have maximized sales of your own product. What it will do, if you start to add an additional product, is it will take the focus away from your base product. You want to make this a solid success before you jump onto something else. I can tell you that I made the mistake that I’m telling you not to make. As a result, I think that I was set back by two or three years. Now, I persisted, and it worked for both of the businesses, but I will tell you that I have no doubt in my mind that I was set back by two or three years because of that. The mistake that I made was that I started focusing on two businesses instead of one. Zondra Wilson: Okay, so for contests, if I want to run a contest to actually give away a product or give a percentage off of a product, do you recommend that? Ajay Prasad: Yes, for your kind of product, I definitely recommend it. You can even do the contest, and you can say, “I’m doing a marketing campaign, so you use my product and tell me it works. Of course, if it doesn’t work, you ignore it because I’m giving it to you for free, but if it works, all you do is give me a video testimonial of what you liked about it. Whoever we select as the best one” – say, you give them one year of free supplies or something like that. Those are the kinds of things that work because you ask them to post it on their Facebook and send it to you. So, you can use contests very cleverly to get some viral marketing. Zondra Wilson: Okay. My last question that I have for you is in dealing with trade shows and business expo events. Do you think that that’s a profitable thing for small businesses or a business like mine at this stage? Ajay Prasad: I think it is, at least one time. Again, it’s a test, so it cannot hurt because what it does is it tells you what kind of people are going there, so you get some sense of your competition. Also, when people are coming in, you will see what their reaction is. At this point, when you go to a trade show, obviously, you are looking for the distributors for your product, right? Ajay Prasad: It may be a little bit early. The reason I am saying that is that, just because your product is sitting on the shelf somewhere, it doesn’t mean it’s going to move. You know that. So, there has to be a name. There has to be promotion and everything, and unless there’s a promotion, it may lead to someone saying, “I’m excited. I want to offer your product,” but if they don’t promote it at the retail level, then it will just sit there, and it will, if anything, impact you future sales with that channel. So, be very careful. Again, going there can’t hurt because you will at least see what kind of interest people have when they come to your booth and talk to you. And then, I would really focus on asking them how they’re going to promote it. You just say, “Listen, I don’t have any big budget for marketing, so how would you promote it?” If they say, “You can put a banner in my store. I don’t mind,” then, sure, I’d jump at it because you can put a banner on top so that it will grab people’s attention. Most of the problem in the store is exactly the same problem as when you watch TV. When you have 50 similar products sitting there, why would someone even look at your product? So, that is the challenge. Again, I don’t know the details of your industry. You know it better. So, if you feel like people are going there and looking for solutions at the store level, and they will try a new thing because it is there, then sure. It cannot hurt to be in a booth there. Zondra Wilson: Okay. When you go to these trade shows, they have these big, elaborate booths. Is it okay if I just have a table and maybe a banner? Ajay Prasad: Yes, that’s what you can afford anyway. But, again, what it does is it will give you a feel for what sort of interest people have in your product. Zondra Wilson: Okay, I think that’s everything. Wow! You’ve been so helpful. Ajay Prasad: That’s wonderful, and I hope that some of these things were helpful and that you’re able to use some of these things that we discussed. Zondra Wilson: Well, I’m going to do the digital marketing right off the bat. I’m going to sit down and plug in with Facebook, dealing with my current clientele and then just build. I know who my ideal customer is, but what I didn’t know is to just concentrate on Southern California. Before, I was just putting it out there for everybody. Ajay Prasad: Again, the reason I’m saying Southern California is because you want to test with a small set of people so that you can see what kind of result you are getting. Very often, it is very difficult to get things right the very first time. This is the reason why very large corporations, even companies like Procter & Gamble for example, test every advertising campaign in the small markets before it goes into every other place. The reason they do it is because, if they are testing it in a tiny market like Peoria, Illinois, and they spend $20,000.00 or $30,000.00, they can gauge what kind of response they are getting from people for that. Based on that, they will launch a national campaign. I have been part of marketing in major corporations for a very big chunk of my life, and with many, many campaigns where we would spend $300,000.00 or $400,000.00 to create the ad, we would abandon that ad because, in a test market, it didn’t do well. Zondra Wilson: Okay, that makes sense. Ajay Prasad: So, that’s why I’m saying that you want to create your own test market first. So, you are saying, “Okay, these are the kind of people that I’m going after, and this is a small area.” That way, you will have the total concentration. Suppose you say, “Okay, my clientele is women 35 to 50.” I’m just simplifying it. If you do national, and you say, “My budget is $200.00 for the test,” it very quickly goes to those people there, and so maybe 0.001 percent of the people saw your ad. If it didn’t work, you don’t have a way to redo your ad and test with the same group again. But if you have limited it to, say, Los Angeles, and you say women 35 to 54, then you know that you have reached a big chunk of those women, and if it did not work and you are testing with something new, then you know that the same people are getting it, so you will see if the response is better or not better. So, that’s the reason why testing is so important with a very small segment of people. Zondra Wilson: Okay, that’s it. Thank you! Announcer: Thank you for listening to this episode of The Founder’s Corner podcast. If you enjoyed this episode, be sure to follow and rate us on iTunes, Stitcher, and SoundCloud. If you’re listening through one of these programs, visit our main page at www.GMRWebTeam.com/The-Founders-Corner.